Approximately 2,200 lightning strikes hit the area stretching from Santa Barbara County to LA County, according to Curt Kaplan, a meteorologist with the National Weather Service in Oxnard. A strong batch of thunderstorms created “lightning storms,” the NWS Los Angeles said — prompting the agency to alert residents to take precautions as they peeked at the power of mother nature. 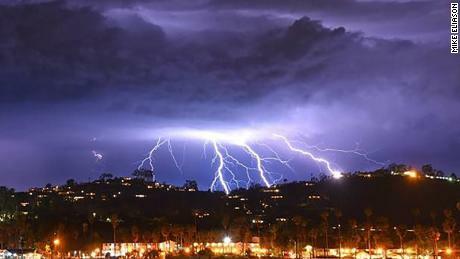 Mike Eliason, Santa Barbara Fire’s public information officer, captured dramatic bolts of lightning over Santa Barbara. 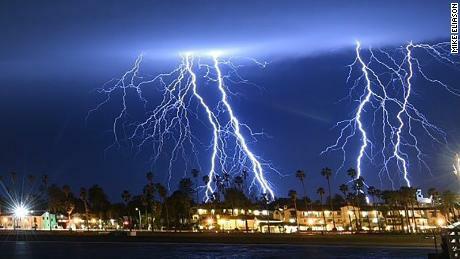 The pictures resembled a scene one would see in Florida, which has been dubbed the lightning capital of the US. What’s driving this strange weather pattern? Meteorologists called this phenomenon the Atmospheric River, where the jet stream is coming further south and pushing an abundant amount of moisture into the area, Kaplan said. But this strange event, is just another weird weather occurrence this winter — the area last month had a dusting of snow along the coastline in areas including Malibu. “For Southern California, its unusual,” Kaplan told CNN. Lightning typically hits the area in the deserts during the summer monsoonal season. CNN’s Paul Vercammen contributed to this report.